The magnificent, royal emerald is the traditional birthstone for May. It is also the birthstone for the zodiac signs of Taurus and Cancer. These five rich emerald Swarovski heart charms, sparkling and shimmering from our sterling silver Emerald Bracelet with Crystal Hearts instantly focus the entire room’s attention on the wearer of this beautiful piece of jewelry. Stand out in the crown with the magnificent piece of jewelry! The Emerald Bracelet with Crystal Hearts would make for a wonderful gift for anyone who has a birthday in May, or enjoys the color emerald. Make a lasting impression with our Emerald Bracelet with Crystal Hearts, and give a gift that keeps on dazzling for years to come! 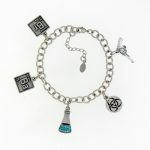 Looking to personalize a charm bracelet? You can always add charms to the Emerald Bracelet with Crystal Hearts. Make this bracelet the perfect bracelet with some of our Sterling Silver charms!